The Zapper, known as the 光線銃シリーズ　ガン (Beam Gun Series Gun) in Japan, is a light gun accessory for the Nintendo Entertainment System. It was first released in Japan in 1984, in North America in 1985, and in Europe in 1986. In Japan, it resembles a revolver. Due to regulations on toy guns, when it was released in Western markets it was redesigned to resemble a science-fiction ray gun. Four years after its initial release in the United States, it was redesigned again to further distance itself from a real gun, becoming bright orange rather than grey. In 1970, Nintendo began developing their "Beam Gun" series of toys, utilizing a light gun designed by Masayuki Uemura. Once the trigger was pulled on the light gun, a flash would be detected by solar cell technology, which would record a hit. The first line, "Beam Gun SP", had a range of 24 feet, whereas the second line, "Beam Gun Custom", had a range of 300 feet. In 1971, Nintendo president Hiroshi Yamauchi wanted to expand their lightgun toys into a shooting range simulation. He asked Gunpei Yokoi, who had created several successful toys for Nintendo, to create a simulation based on clay pigeon shooting. Hiroshi Yamauchi intended for these shooting range simulations to be installed in vacant bowling alleys. After Americans brought bowling to Japan after they continued to live there after World War II, bowling became a popular Japanese pastime. The Japanese bowling fad was short-lived however, as by the 1970s, many bowling alleys were sitting abandoned. Nintendo purchased several of these bowling alleys with the intention to convert them into electronic shooting ranges. Gunpei Yokoi and Masayuki Uemura, together with Genyo Takeda, worked under the newly formed Nintendo Research & Development 1 division of Nintendo, and created a shooting gallery game to use in Nintendo's converted bowling alleys. The result was the Laser Clay Shooting System, which consisted of a screen, with a film of clay pigeons broadcast on it over an overhead projector. In front was the lightgun, which when fired, a network of reflective surfaces would register whether the shot was a hit or a miss. The game was unveiled in 1973, however its first demonstration didn't work properly. Yokoi had to stand behind the screen, adding the score to the system manually. After its unveiling, the bug in the program was fixed, and the game worked perfectly for the rest of the time it was in operation. After the 1973 Oil Crisis, Nintendo had to abandon its grand plans to use Japan's bowling alleys as electronic shooting ranges. They reduced the size of the system so that it could be sold as an arcade game. The Laser Clay Shooting System was adapted for the smaller setup and was sold to arcades as Mini Laser Clay. Sales for Nintendo's Simulation System started off slowly, but they gradually increased in volume, which led to Nintendo adapting the system for use with other 16-mm films. The additional games were Wild Gunman in 1974, Shooting Trainer and Sky Shark in 1976, Battle Shark in 1977, and New Shooting Trainer in 1978. In 1976, Duck Hunt was released. 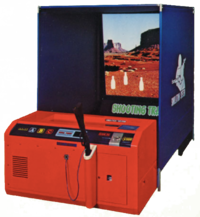 This light gun game used projected targets, like the Simulation System games, but the system itself was much smaller due to the fact that it was intended for home use. In 1983, Nintendo Research & Development 2 developed the Family Computer console. Shortly after its release in Japan on July 15, 1983, they began to develop light gun games for use with it. When the Beam Gun Series Gun, released as a part of Nintendo's successful light gun toy line, was released on February 18, 1984, an adaptation of Wild Gunman was released alongside it. The Famicom Beam Gun resembled a revolver, which fit in with the Old West theme of Wild Gunman. Another adaptation of a light gun game, Duck Hunt, was released on April 21, 1984. Duck Hunt also had a 'C' game mode, "Clay Shooting", that was an adaptation of Nintendo's first light gun arcade game, Laser Clay Shooting System. Later that year, an original Famicom light gun game, Hogan's Alley, was released. Some games were released that had optional light gun support during specific sections in what were not otherwise shooting games, including The Adventures of Bayou Billy and Track & Field II in 1988, and Laser Invasion in 1991. Bandai released a machine gun peripheral for the Famicom titled the Hyper Shot in 1989. The difference between the Beam Gun and the Hyper Shot was that the latter was set up for rapid-fire and that it contained a directional pad. The latter made it so that the pack-in game, Space Shadow required the Hyper Shot to play, as without a d-pad it is impossible to navigate the game's corridors. When the light gun came to North America in October 18, 1985, it was renamed the Zapper. The Japanese Beam Gun resembled a revolver, but due to government restrictions in the United States, the Zapper was redesigned so that it would resemble a ray gun from science fiction. In 1989, the color of the Zapper was changed from grey to orange to further distance it from a real gun. In November 1988, it was included as a pack-in with the "Nintendo Action Set", which included the NES console, the Zapper, and a multi-cart that contained two games on one cartridge, Super Mario Bros. and Duck Hunt. In December 1988, it was included as a pack-in in another system set, the "Nintendo Power Set". This included the NES console, the Zapper, the Power Pad, and a multi-cart that contained three games on one cartridge, Super Mario Bros., Duck Hunt, and World Class Track Meet. Although it was most popular as a pack-in, the Zapper was also sold separately from the system. Several Zapper-compatible games were released exclusively in Western markets including Gumshoe in 1986, Gotcha! The Sport! in 1987, Freedom Force in 1988, Operation Wolf, To the Earth, and Shooting Range in 1989, and Mechanized Attack and Barker Bill's Trick Shooting in 1990. In addition, The Lone Ranger, released in 1991, had Zapper support during some gunfights. There were also a few unlicensed games that were released that utilized the Zapper, including Baby Boomer in 1989, Chiller in 1990, and Super Russian Roulette in 2017. The Adventures of Bayou Billy Konami 1989 Not yet Zapper optional. Baby Boomer Color Dreams 1989 Not yet Unlicensed. Zapper optional. Chiller Exidy 1989 Not yet Unlicensed. Zapper optional. Day Dreamin' Davey Sculptured Software 1992 Not yet Zapper optional. Duck Hunt Nintendo Research & Development 1 1984 Not yet Sprite-based remake of the 1976 projector-based lightgun game. Freedom Force Sunsoft 1988 Not yet Requires both a Zapper and a controller. Gotcha! The Sport! Atlus 1987 September 17, 2018 Requires both a Zapper and a controller. Laser Invasion Konami 1990 Not yet Zapper optional. The Lone Ranger Konami 1991 Not yet Zapper optional. Mechanized Attack SNK 1990 Not yet Zapper optional. Operation Wolf Taito 1989 Not yet Zapper optional. Super Russian Roulette Batlab Electronics 2017 Not yet Unlicensed. Track & Field II Konami 1988 Not yet Zapper optional. Nintendo Research & Development 1 1984 Not yet Sprite-based remake of the 1974 16-mm film-based Simulation System arcade game.